You are buying ONE pillow case. Fabric is 100% cotton with an Marvel Super Heroes print. 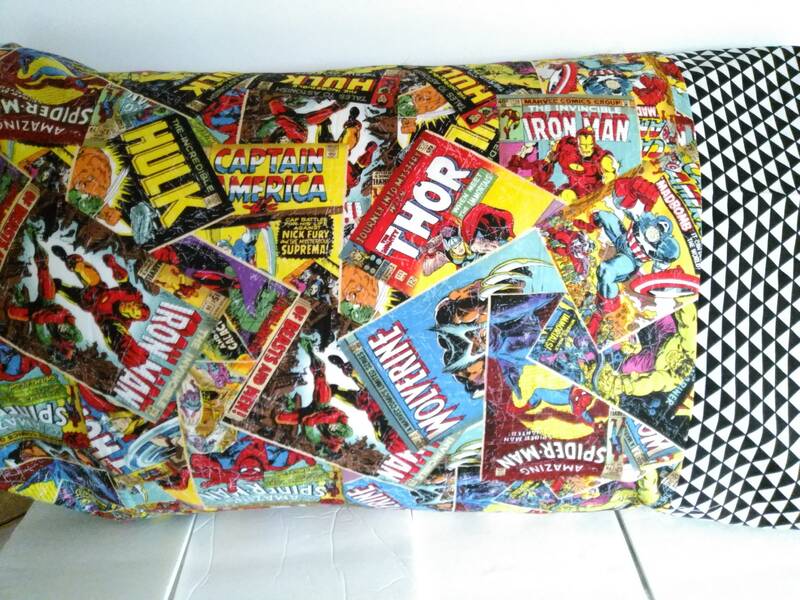 The pillow case will fit any standard size pillow measuring 20 by 29. I am not responsible for lost,damaged or stolen packages. I'll ship anywhere-just ask and I'll get a price. Just what I ordered - perfect! -I take Paypal and credit cards. -I take weekly and biweekly payments on orders over 25.00 dollars. Your item will be shipped when payment is paid in full. -If you request a special custom order-a non refundable half of payment is requested before I start on the item. Items must be returned within 14 days of notifying me. All items must be returned within 14 days unworn with tags still attatched or they will be sent back and the refund or exchange refused. I mail to your etsy address and not your paypal address so please make sure your etsy address is correct. I am not responsible for lost, damaged or stolen packages. If you choose to use Priority U.S. mail , I will get a confirmation number sent to you through the postal service. I ship items as soon as I can. Please know that I will contact you when it mails out and it might take me a few days(up 7 days for ready made items) to mail. I also mail to your address that is on your etsy account. I appreciate your understanding. I shipped ready made items as soon as I can. (I am not taking custom orders at this time)Custom made diapers will usually take 7 to 9 days before it is shipped. Large orders will take up to 11 to 14 days. Huge orders might take even longer and please contact me before you purchase to see how long it will take. If you need diapers right off please check out my already made diaper section. I make all the items in this shop(except for the cross stitch) and custom orders do take longer. Depending on your location and how long your postal service takes.